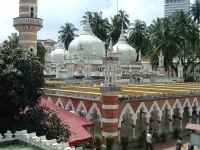 Masjid Jamek (the Friday Mosque) lies where the Klang River meets the Gombak River. Palm trees and curved steps lead to the water's edge, deepening the mosque's air of tranquillity. The site is very much a haven within the buzz and rush of Kuala Lumpur. Visitors will find dazzling photo opportunities amid the combination of ancient Moorish, Islam and Mughal architectural styles, and leafy surroundings. Custom demands that they dress conservatively and remove their shoes on entering. Mosque staff will supply men and women with the appropriate attire if necessary. Masjid Negara (the National Mosque) offers a modern contrast to the Friday Mosque and is also worth visiting. Opened in 1965, it's one of the largest in Southeast Asia. Transport: Friday Mosque: Masjid Jamek LRT station. National Mosque: LRT to Pasar Seni LRT station.